Do this recipe only with porcini buttons, the immature mushrooms that still have white pores. They need to be very firm for this to work right. Unfortunately, I have yet to find another mushroom that responds this well to grilling; portobellos are OK, but are like a Chevy to the porcini’s Lamborghini. The only thing even close are those king trumpet mushrooms you can sometimes get in farmer’s markets or at places like Whole Foods. So do this recipe when you’ve found your own porcini, or want to splurge. Roaring high heat is the key. I get my grill up to 500 degrees. You could roast them in an oven at that temperature, too. Lay the mushrooms down on the cut side and don’t move them for a long while — you want those pretty grill marks. And only cook on one side, with the grill cover down. They’ll cook through, don’t worry. I know this plate looks baroque, but it’s not. I grilled some Sierra Nevada wild onions I found alongside the porcini, added a little lemon zest and fresh oregano from the garden, and dotted the plate with preserved garlic. I plan on posting about this amazing garlic soon; the technique is from my friend Paul Virant’s new book, The Preservation Kitchen: The Craft of Making and Cooking with Pickles, Preserves, and Aigre-doux. It’s not important to exactly replicate this dish. What’s important is to have a few things on the plate that go well with a grilled porcino: Onions, garlic, a little lemon, something herby. The net effect is a vegetarian’s fantasy, so good even the committed carnivore won’t care or even really notice. 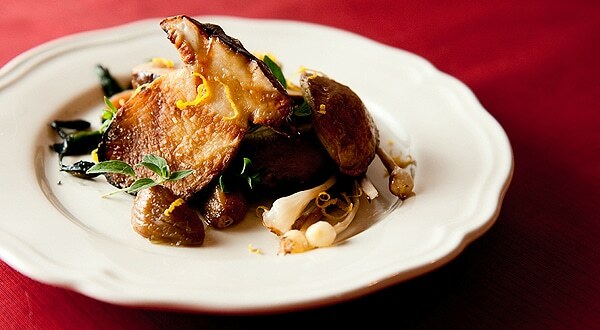 Porcini, when grill-roasted like this, take on a dense, meaty texture. They smell of the forest and of that musky warmth that attracts most mammals. And they taste savory, are tender in the center yet crispy on the edges, juicy and just faintly sweet. They taste like the best mushroom you’ve ever eaten. Because they are. 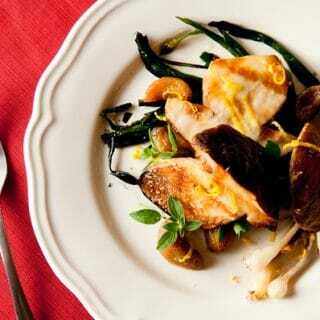 This is one of the simplest, and best ways to cook porcini mushrooms, which, if you are French you call cepes. If you're German you call them steinpilz. I especially love this method with our Pacific spring porcini, which are Boletus rex-veris, a variant of the typical B. edulis. They happen to be a little firmer and are normally less buggy than their autumn cousins. Get your grill going so it is at least 450 degrees, and better yet 500 degrees when you start. Make sure the grill grates are clean. Whittle off any dirt from the stems of the porcini and wipe the caps down with a damp paper towel. Slice in half. Paint with olive oil and salt well. Coat the onions in olive oil and salt them, too. Lay down the onions on the grill, then the porcini cut side down. Close the grill grate and leave for 5 minutes. Remove the onions, which will be partially charred, and immediately wrap them in foil. Set aside. Close the grill again and keep roasting the mushrooms for another 5 minutes. Lay the onions on the plate and top with the mushrooms. Place some roasted or preserved garlic around the plate, drizzle some more olive oil over everything, and garnish with lemon zest and oregano leaves. Right before you serve, grind some black pepper over the plate and squirt with a little bit of lemon juice. It is important to cook these over high heat, in a covered grill -- and to use perfect mushrooms. Don't try this with mediocre porcini; and no, there is no substitute. Nothing is like a grilled porcino. If you cannot find porcini or matsutake, I suppose king trumpet mushrooms might work. I could not agree more, Hank. Grilling porcini is definitely the way to go. It works great with a grill pan on the stove top if you don’t want to pull out the barbeque too. The key seems to be that high heat for a short duration. I just finished working my way through my last batch of fresh spring kings. Yum! I just picked up some gorgeous porcinis from the market today (have been waiting for them since last year!) 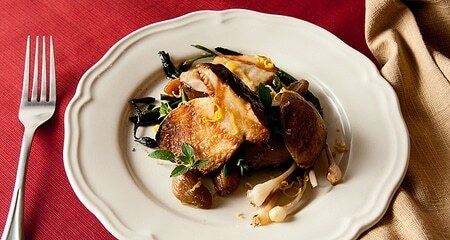 and pickled ramps from Paul Virant’s book–I am so looking forward to making this! thanks for the pairing idea. I’ve grilled thick slices but as it looks in your post these were really small buttons simply cut in half. It makes me wonder if this would not work as beautifully with a Butter or Queen Bolette button? Have you ever tried this technique with a whole Cocora (Amanita lanei) cap? Anyway, love your website. Awesome insights and information…not to mention good eats! P&S: Yep, it absolutely works with butter and queen boletes. Never done it with a coccora, though.